INTRODUCING MODULAIR- A COMPACT WATER CHILLER WITHOUT COMPROMISE! ModulAIR is a water cooled chiller that brings robust serviceability and ASHRAE 90.1-2010 efficiency into a single compact package. Chiller sizes are available in 8, 10, 12, 15, 21, 25, 41, 48 and 55 tons. Each chiller can be used as a stand-alone unit or combined for installations up to 550 tons. Chiller modules of any size can be mix and matched without limitation! Some users try to avoid modular chillers because traditionally they haven’t been as reliable as conventional chillers. ModulAIR brings all the robust features of a full size chiller into a compact foot-print. 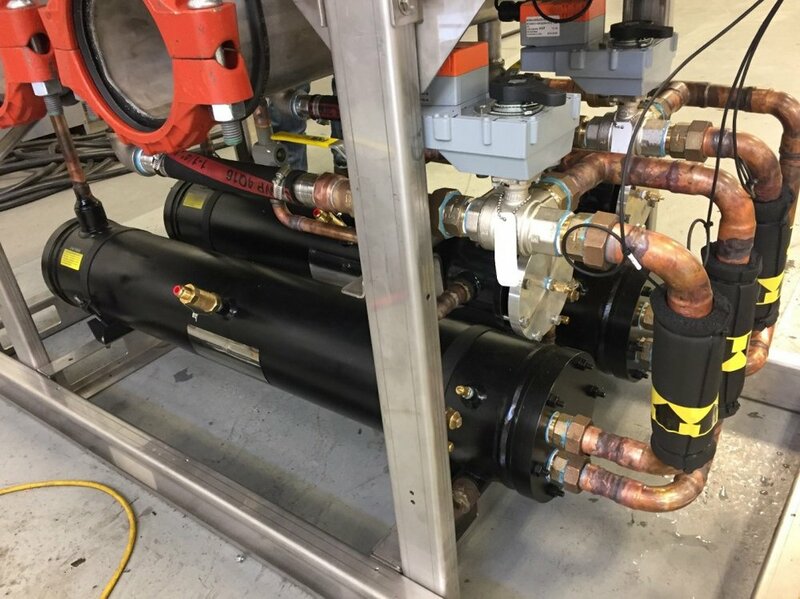 Fully cleanable shell & tube condensers and replaceable filter driers mean that customers no longer need to sacrifice reliability when a compact design is needed. Standard features such as compressor oil level and flow monitors show that this chiller takes reliability more seriously than the rest. Unlike other modular chillers, ModulAIR is designed such that the condensers and evaporators can be serviced while the rest of the unit remains in operation. Unions on factory installed water piping can easily be removed to gain access to the front of the condensers for cleaning. The electrical control panels are hinged and rotate outwards allowing for easy access to the compressors. This means that service clearance is required from the front side of the chiller only, resulting in a smaller overall installation. Smart controls are where this chiller differentiates itself from the rest. Each chiller module can run autonomously. The unique control algorithms are duplicated in each chiller module eliminating the need for any “master” controller. This removes a significant point of failure and improves redundancy for critical applications. All ModulAIR chillers feature compressors with capacity control from 100% to 10% with advanced unloader technology. Operators no longer need to wonder at which point their chiller is the most efficient. The built in control sequence automatically determines how many compressors should be operational to deliver the lowest energy consumption possible. It doesn’t matter what the conditions might be, ModulAIR will automatically try different operational scenarios to determine which is the most efficient. For applications where down-time is not acceptable, ModulAIR features a unique high head pressure avoidance sequence. This means the chiller will anticipate a high head pressure lockout situation and make every attempt to remain online during the most harsh conditions. If a cooling tower fan motor fails, or condenser water flow is restricted, the chiller will unload its compressors to take advantage of whatever heat rejection capacity remains available. Conventional chillers will simply continue to control to their chilled water set-point and end up tripping on high head pressure, remaining offline until the facility operator hits the re-set button. A wide variety of feature are available on the ModulAIR chiller for users who are concerned with energy efficiency. For systems that require variable primary flow, chillers are available with 2-way motorized valves. 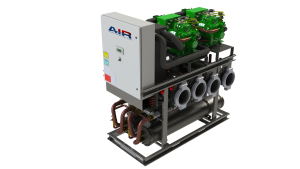 This allows the chiller to control to a constant return temperature while saving on chilled water pump energy. The condenser features a water regulating valve to properly control head pressure while reducing the amount of condenser water required in winter months. Because of its modular design, other specialized accessory modules can be added to any system. A pre-engineered skid with pumps and tanks is available for a simplified installation. For water cooled systems, a free-cooling module is available which can take advantage of energy savings during winter months. This feature allows the chiller to save on compressor energy by using cold condenser water to cool the chilled water supply, rather than using mechanical cooling all year round. ModulAIR can also help save energy in applications where cooling and heating is required at the same time. Condenser heat is wasted when it’s rejected outdoors. This can be used to satisfy heating requirements for domestic hot water, space heating, or other process heat loads. Unlike other small chillers that use high pressure refrigerants, ModulAIR uses a medium pressure refrigerant, allowing it to operate at higher discharge pressures more efficiently. This means that users can generate 175 F hot water from this chiller for all their hot water heating requirements! ModulAIR is a compact water chiller manufactured by Advance Industrial Refrigeration (AIR). For more information, visit the ModulAIR page. The most common styles of evaporator and condenser heat exchanges used in Water Cooled DX and Water Chiller applications are Shell & Tube and Brazed plate. In the evaporator, refrigerant changes from the liquid to the gaseous state while removing heat from the cooling fluid. In the condenser, refrigerant changes from the vapor to the liquid state giving heat to the heat rejection fluid. Choosing the right heat exchanger depends on the situation at hand. Their typical construction materials consist of stainless steel plates held together with a copper based brazing material. Water and refrigerant circulate in alternating plates. This style of heat exchanger can be used for both evaporators and condensers. Figure 1: Brazed plate heat exchanger installed in chiller as evaporator. Their space efficient shape (rectangular allows for compact unit design. The non-ferrous construction eliminates rusting. The alternating plate design makes the brazed plate evaporators less susceptible to freeze damage when compared with shell and tube evaporators. The small passages encourage turbulent flow, which can benefit heat transfer. They are less expensive when compared with a shell & tube design. The smaller passages lead to a higher water side pressure drop. They are subject to plugging/fouling, also due to the smaller passages. Although they are typically constructed of stainless steel, the brazing material is copper based and can sacrificially corrode. Their construction materials usually consist of a carbon steel shell with end plates and copper tubes. With a DX Evaporator, water circulates in the shell side while the refrigerant passes through the inside of the tubes. In a condenser, the water flows through the tubes while the refrigerant remains inside the shell. Figure 3: Two shell & tube heat exchangers being used as condensers in a water chiller. Less water side pressure drop due to the larger tube size. Tube leaks are easily located and plugged. They can act as a liquid refrigerant receiver helping with pump-down and low ambient situations. Much easier to service (clean and repair leaks). A better solution for water derived from open cooling towers, rivers, lakes, sea coolant, and other fluids at risk of clogging in narrow spaces. Rugged mechanical construction due to its thicker tube walls. The shell is also available in stainless steel, for sea water and other highly corrosive applications. Less thermally efficient due to less total surface area. More expensive when compared to brazed plate. In evaporators, the water is passing over a carbon steel surface. Figure 4: Shell & tube heat exchanger with end cap removed, tube passages are typically 3/4″. For heat exchangers that use cooling tower water, river, lake or a similar source, it is highly recommended to use a Shell & Tube condenser because of its larger passages and lower probability of fouling and scaling. Shell & Tube heat exchangers can be easily cleaned just by removing the end plates and brushing the tubes. However, for situations that use a closed loop water source, or coolant such as glycol, a Brazed Plate condenser may be used to lower cost and achieve better thermal performance in compact design. When using a brazed plate heat exchanger, a strainer with an appropriate mesh size should always be used.